I’m all about easy quick appetizer that everyone will love. The kale is SO good in this dish and dare I say, healthy-tasting…in a great way. I think cheese dips needs some form of greens or health to balance them out a bit. The kale adds such a nice texture to it too. The mushrooms add some nice meatiness without having any meat whatsoever. I went to Eataly a few weeks ago and picked up some super fancy mushrooms (chantrelles and shiitake) and was looking for a home for them. This dip fit the bill! But you can use any mushrooms you like. If you can’t find chanterelles or shiitakes, no big deal, cremini mushrooms would work too. I mean, even white button mushrooms would work. 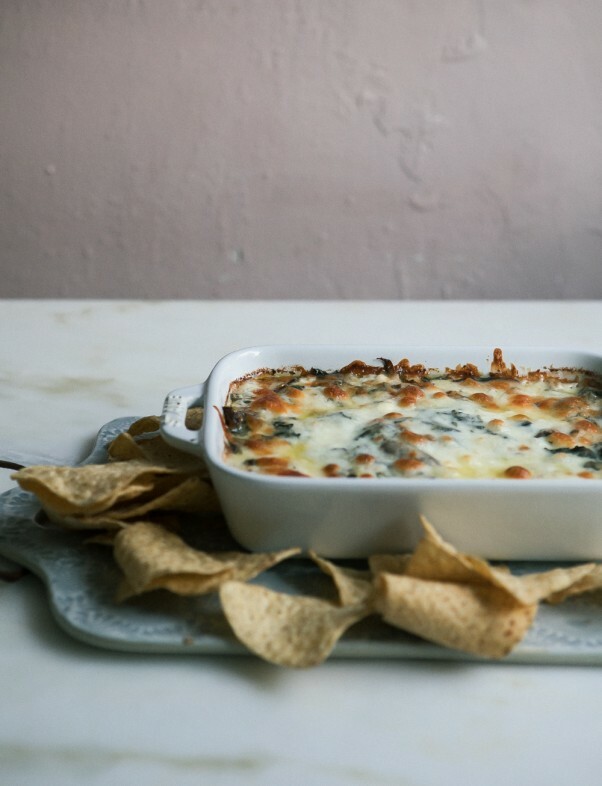 This is a versatile dip. 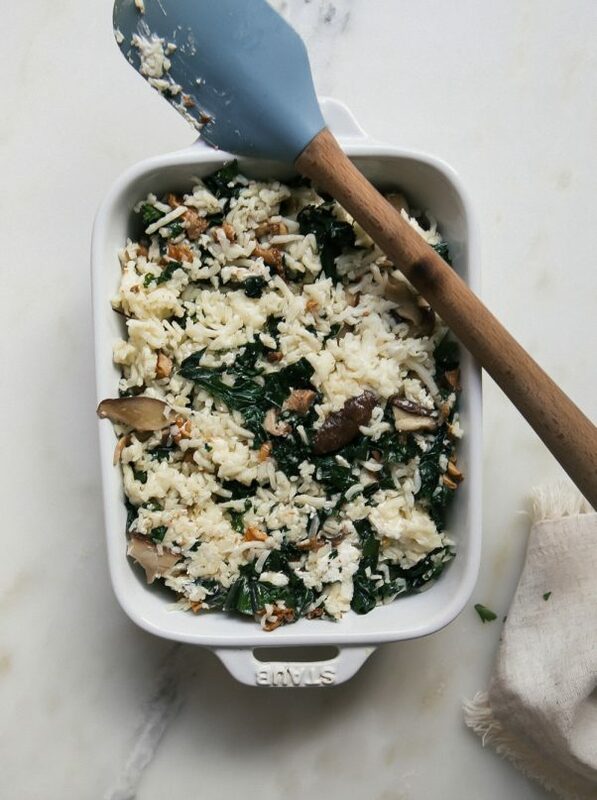 The key to this dip tasting good is sautéing the mushrooms and kale before they’re mixed with the cheese. Kale really needs some warmth and oil in order to break down and taste good. 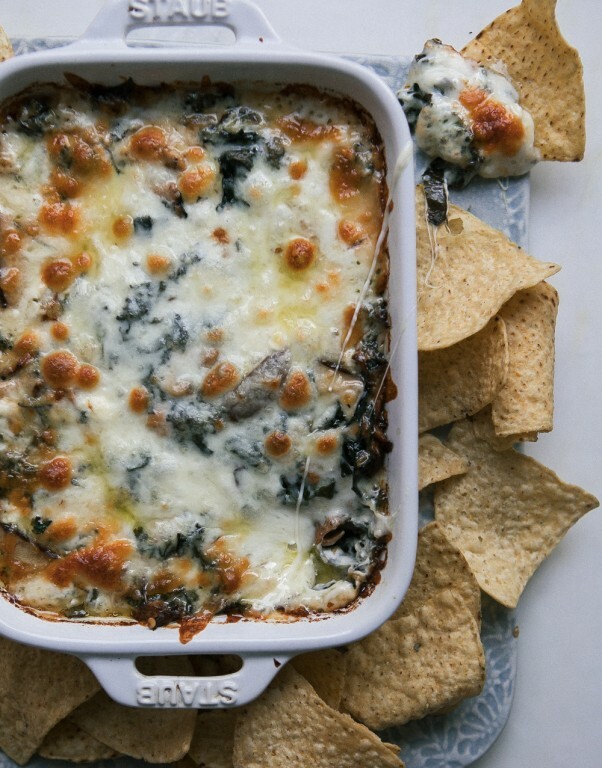 If you’re looking for a quick, delicious dip during the holidays, this is it! In a large saucepan, set over medium heat, add the oill to the pan. When the oil is warm, add the shallot, garlic clove, kale and mushrooms. Cook for about 5 to 7 minutes, until the kale has wilted and mushrooms have cooked. To a large bowl, add the parmesan, mozzarella and cream cheese. Mix together until smooth-ish. Add the reserved mushroom and kale mixture, red pepper flakes and a few pinches of salt. Mix until thoroughly combined. Transfer to a 1-quart baking dish. Top with a handful of mozzarella and place in the oven to bake for 15 minutes, until the top is lightly golden brown. Note: If you'd like the cheese to be a bit more golden brown, like mine, place it under the broiler for 2 minutes, being sure you're watching it the entire time.